O’Pen BIC sailors from the Northeast are invited to compete in the 2014 O’Pen BIC North American Championship, which will be hosted by the Royal Hamilton Amateur Dinghy Club (RHADC) in “Mangroville,” Paget, Bermuda from April 24 – 27. Organized by RHADC in association with the Bermuda Sailing Association, the North American O’Pen BIC Class and the Bermuda O’Pen BIC Class, the event will comprise a U13 division for competitors born after 2001 and an Open division. 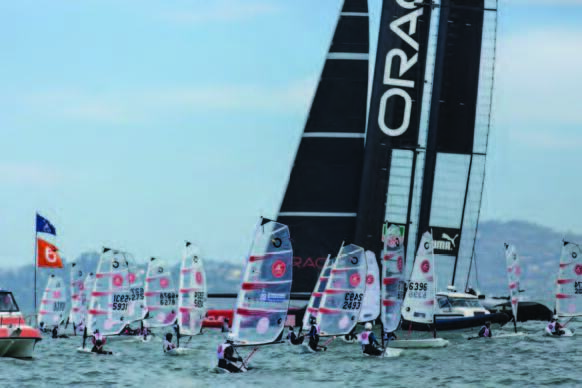 “There will be an O’Pen BIC performance clinic with filming on Thursday, April 24, and perhaps team racing if enough teams are interested,” said organizer Nevin Sayre, the Youth Sailing Programs Director at BIC Sport North America. Prizes will be awarded to the first three boats in each division, and the top female sailor in the U13 and Open divisions, and race-ready charter boats are available from the RHADC and O’Pen BIC North America. The deadline to reserve a charter boat is Friday, March 14. To make a reservation, contact Sayre at nsayre@aol.com. The entry deadline is also March 14, with a late fee after that date. Sally’s Sailing with Team SCA!